-What Constitutes the ‘Top of the South Research Lodge’? -How many Masons does it take to change the face of Freemasonry? 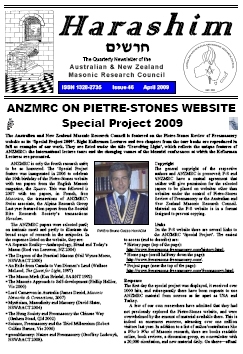 Harashim is published four times per year, and contains a wealth of information of direct interest to brethren interested in Masonic Research, in Australia, New Zealand and Internationally. All member Research Lodges of the ANZMRC receive limited copies of Harashim. Joining the Correspondence Circle will enable you to DIRECTLY receive Harashim on a regular basis. It will also entitle you to join the ANZMRC email list (if your lodge is not a member of ANZMRC). PLEASE NOTE - paid subscriptions are no longer being taken. From mid 2005 Harashim will be available only in electronic format (pdf file) by email to new members of the Correspondence Circle.